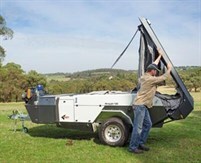 The test editors at Camper Trailer Australia have towed their share of trailers, and through some incredibly rough terrain. When you're heading offroad, it's not enough to have a camper with a luxury mattress, or a schmick paint job, or even the highest quality camp kitchen. You won't get far in the Aussie bush without some of the qualities that these top campers boast. 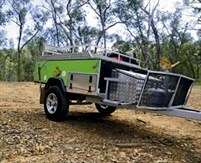 Durable suspension; a strong chassis; decent tyres; trailerability and spare gear are just a few of the areas in which these ultra-tough trailers excel. Before you consider buying an offroad trailer, read these reviews of our top picks to help you decide. The Ultra D is an outstanding piece of engineering. It's tough, practical and good looking, with superb finishes and materials. The awesome Odyssey Signature Sportz camper trailer takes five minutes to set up and can handle very rugged offroad conditions. 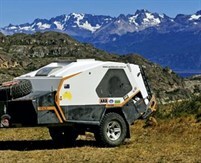 A decade of refinement has pushed this self-sufficient, family-friendly offroad camper to the top of its class. 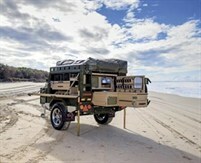 This military-style camper boasts innovative imagination that has captured the attention of the Australian camping community. This hardy camper makes the most of its hardfloor dimensions thanks to some clever inclusions. With plenty of luxury and a very manageable tare, the versatile XPLOR is as offroad as the car that tows it. The versatile and rugged TMO Gen III slide-on by Trayon is an Aussie-made marvel, boasting presence, individuality and practicality. Trackabout’s best-selling camper oozes comfort and luxury and every component is of exceptional quality. The range-topping model in the Tvan line-up shares the same body, chassis, suspension and tow coupling as its stablemates, plus a few welcome touring comforts. Pioneer combines offroadability, ample storage capacity and a low tare in a hardfloor configuration with quality fittings and fixtures. With its irreverent, go-anywhere attitude and tough-kid good looks, the X1 proves it can walk the walk among the best. The Evolution is practical, well-constructed and certainly capable of taking on the rigours of any track with the comforts of home.